Tawlet Ammiq is the eco-restaurant of the Shouf Biosphere Reserve located in the Ammiq Park House overlooking the Bekaa valley. The restaurant was built to be environmentally friendly, to showcase the culinary traditions of the region, and to support the small farmers of the Bekaa. It has become a must for those wishing to enjoy the best of Lebanese cooking. Located on the main road of Nabeh El Safa – Ain Zhalta village. Located near the Barouk cedar forest entrance. Located on the main road in Nabeh El Safa – Ain Zhalta village. Savour traditional Lebanese mezze, fresh fish, grilled “halal” meats, and much more – or have a coffee and a Lebanese narguile while seated outdoors surrounded by waterfalls. The Chateau is located near the intersection of the Qab Elias – Saghbine highway and the Kefraya – Maasser el Shouf road. Chateau Kefraya produces fine wines with grapes grown in Kefraya and all the stages of the wine making process take place on the estate. A fine restaurant adjacent to the Chateau Kefraya showroom where you can lunch or dine. It offers a subtle cuisine combining traditional Lebanese mezze and western delicacies accompanied with chateau Kefraya wines. Baytna, a charming family restaurant overlooking the Barouk river, is located on the main road of the Barouk – Batloun highway. This restaurant is distinguished by the vaulted arches of its indoor dining area that date back two hundred years. Baytna provides an excellent mezze and barbequed meat in a calm atmosphere. Located on the main road in the Barouk village with an amazing view of the waterfalls. 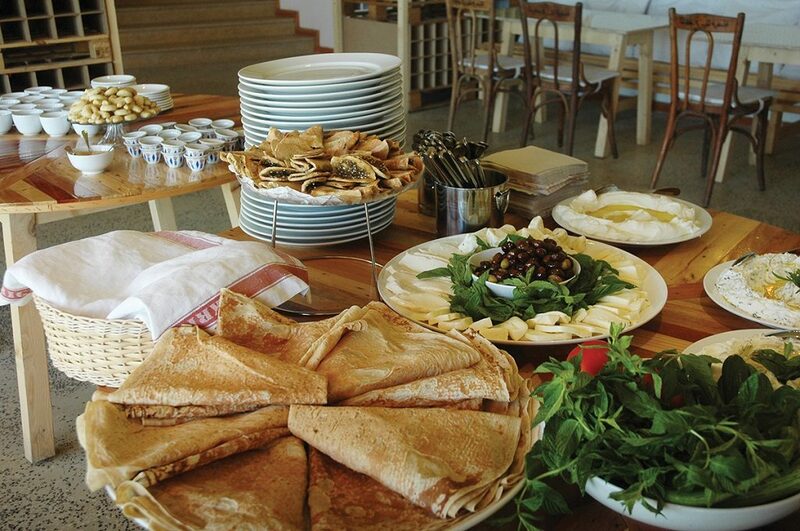 In addition to delicious Lebanese food the restaurant is equipped for large groups and events. Located near the Barouk cedar forest entrance (500 m) it features Lebanese and western menus prepared by professional chefs. There are also rooms where you can spend the night in comfort. Located on the main road in the Barouk village with an amazing view of the waterfalls. In addition to delicious Lebanese food and international cuisine. The Al-Shouf Cedar Society (ACS) launched its Rural Development Program in 1999, to support local communities by providing training and marketing outlets for their food products. There are currently 70 food products carrying the Shouf Biosphere Reserve label that are produced in a traditional manner by local community households. Production is currently being centralized in three workshops located in Mrosti, Baadarane, and Jebaa. Products are sold at all the Reserve entrances (Barouk, Maasser el Shouf, Ain Zhalta/Bmohray, Niha and Tawlet Ammiq, Mir Amine Hotel, Château Kefraya, Kasr el Sultan Hotel- Aley, Bristol Hotel- Hamra, etc. ).